The PDA Union have recently seen the judgement of a Scottish Employment Tribunal where a trainee pharmacy technician at Boots was constructively dismissed after being given a final written warning. This was despite DISPROVING an allegation made in a customer complaint that she had breached confidentiality. We encourage anyone who doubts why joining a trade union is an essential requirement when working in the pharmacy sector, to see for themselves what happened to this loyal, high performing member of staff at the hands of incompetent management. This case demonstrates how company managers badly treated someone with more than a decade of loyal service, whose annual appraisals had always been excellent and who had been awarded an honorarium for her work. As the PDA Union only accepts pharmacists into membership, this person wasn’t eligible to join us, but we’re pleased to see that with the support of her trade union she finally managed to get justice through the courts. As the disciplinary process and subsequent appeal progressed, the individual was unfortunately off sick with stress. Boots management advised her BY TEXT MESSAGE that they were withholding her sick pay. It took weeks for managers to let her know the result of her disciplinary appeal and grievance hearing, despite the technician asking them to let her know what was happening. When it was put to the individual’s manager during the hearing that the management had not conducted a full investigation into the alleged incident, because no investigations were conducted with the patient who had complained, the Boots representative stated that this was not something the company normally do. The company alleged the pharmacy technician had made comments that could cause embarrassment for Boots; however, ironically the incompetence of company managers has resulted in this case being reported in the media and demonstrating to the general public the reality of employment practices at Boots. Mark Pitt, Assistant General Secretary of PDA Union said “I recognise similarities in this case to others we have dealt with in Boots. Whilst all complaints need to be taken seriously, unfortunately there seems to be an unwillingness to properly investigate patient complaints. The company’s acknowledgement that they don’t normally do full investigations would be a sad admission by any employer, and certainly not what you’d expect from the largest pharmacy multiple in the UK with stringent regulatory obligations. This was a serious complaint which could have had significant professional ramifications if it involved a pharmacist. 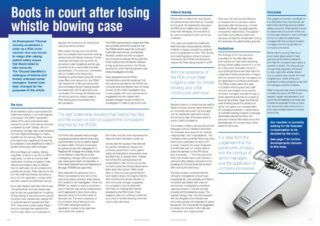 This is not the first time that Boots have been heavily criticised by a judge for the poor quality of their investigations into professional complaints, as reported in the PDA magazine INSIGHT (see article at the bottom of this page).